Proactive Password Auditor | Elcomsoft Co.Ltd. Audit security policies, examine network security and recover account passwords by running a timed attack on account passwords. Proactive Password Auditor helps network administrators to examine the security of their networks by executing an audit of account passwords. By exposing insecure passwords, Proactive Password Auditor demonstrates how secure a network is under attack. Proactive Password Auditor examines the security of your network by attempting to break into the network. It tries common attacks on the account passwords in an attempt to recover a password of a user account. 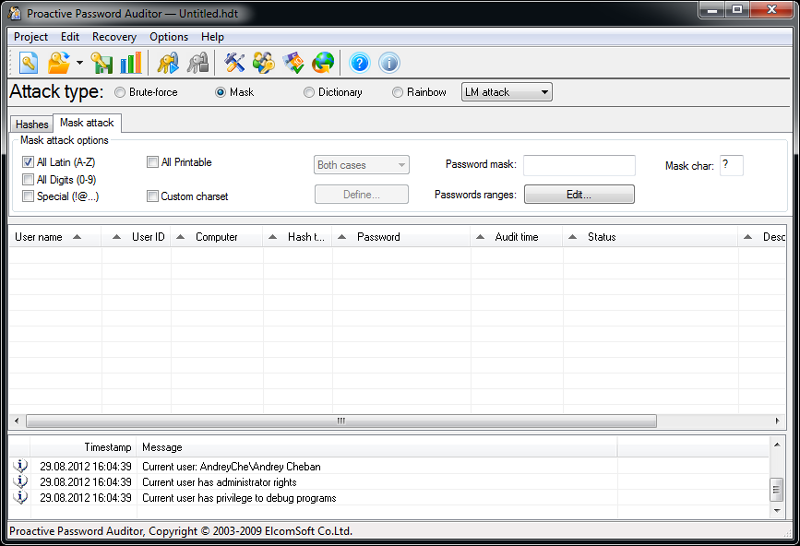 Proactive Password Auditor allows carrying out a password audit within a limited period of time. If it is possible for Proactive Password Auditor to recover a password within a reasonable time, the entire network cannot be considered secure. A single weak password exposes your entire network to an external threat. Password hacking is one of the most critical and commonly exploited network security threats. Network users employ short and simple passwords that are easy to remember, but are also easy to break. They often use repeating characters, simple words and names for easier memorizing. Making them use computer-generated passwords that consist of random characters will only make the problem more severe, as the users will write the passwords down on the proverbial yellow stickers. There is more information available on the issue in the Elcomsoft whitepaper Proactive Is Better than Reactive: Testing Password Safety – a Key to Securing a Corporate Network. Network administrators are also part of the problem, as they may forget purging terminated employees, forcing people to change passwords often, or locking out the users after a certain number of failed login attempts. Weak passwords are easy to break, while complex passwords are difficult to memorize. Having an elaborate security policy is the only way to ensure the security of your network. Does your policy require a regular password change? Make sure to audit the network after every change. Did it take Proactive Password Auditor 30 days to break a password when you performed the last audit? Then examine your network at least once a month to ensure ongoing security. Network administrators can use Proactive Password Auditor to recover Windows account passwords, too. Proactive Password Auditor analyzes user password hashes and recovers plain-text passwords, allowing accessing their accounts, including EFS-encrypted files and folders. Proactive is better than reactive. Testing password safety – a key to securing a corporate network. Proactive Password Auditor uses several basic methods for testing and recovering passwords, including brute force attack, mask attack, dictionary search, and Rainbow table attack. The Rainbow attack is particularly effective, as it uses pre-computed hash tables that allow finding up to 95% of passwords in just minutes instead of days or weeks. Fortunately, the Rainbow attack cannot be performed from outside of your network! You’ll need either administrative access or a dump file exported by Elcomsoft System Recovery. 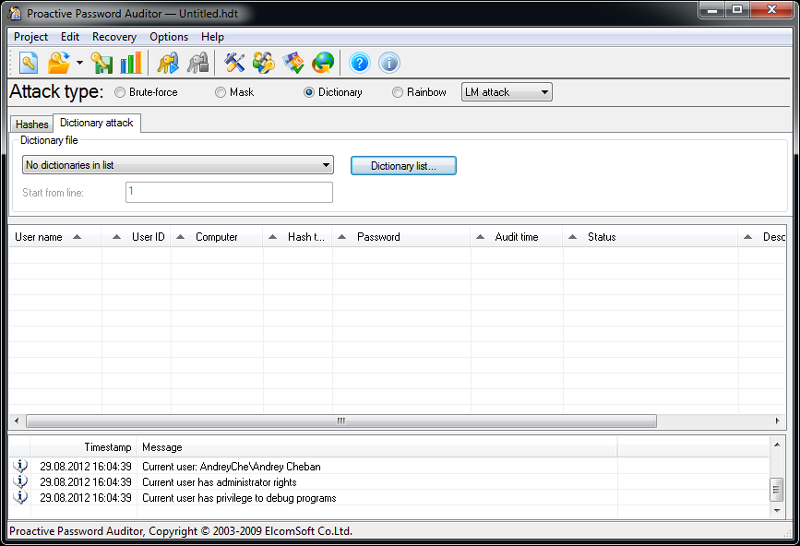 Proactive Password Auditor supports off-line recovery of account passwords by analyzing dump files saved by Elcomsoft System Recovery, local Registry, binary Registry files (SAM and SYSTEM), memory of the local computer, and memory of remote computers (Domain Controllers), including ones running Active Directory. The off-line recovery speed can be greatly enhanced when using Elcomsoft Distributed Password Recovery. Thanks to the patent-pending GPU acceleration technology available in Elcomsoft Distributed Password Recovery, the recovery using a single PC is up to 50 times faster as compared to CPU-only mode and other password-recovery applications. Adding more computers increases the recovery speed linearly with zero scalability overhead. We accept all major credit cards, checks, bank transfers and purchase orders. Sales taxes may be added to your order according to your jurisdiction. Credit card orders are processed immediately. Electronic licenses are generally available instantly after the credit card charge is approved. On rare occasions where we must manually verify your order, the license will be available in 48 hours or less. If you are interested in purchasing thelicense to audit more than 2500 user accounts, please contact us for quote. Please note that the licenses are not"cumulative". That means that, for example, if you purchase twolicenses for 20 accounts each, you still will not be able to audit 40 accounts-- instead, you should purchase one 100-accounts license. To be able to audit600 accounts, you should get the 2500-accounts license (but not one license on500 accounts plus another one for 100 accounts), and vice versa. An unregistered (trial) version expires after 60 days, and allows to perform password audit only for 10 user accounts at a time.